Conveniently take down your pool fence in minutes, and then be able to lock it back in place safely so your children can’t remove it. Make sure your pool fence allows you to conveniently open up your patio for a pool party or other outdoor fun. 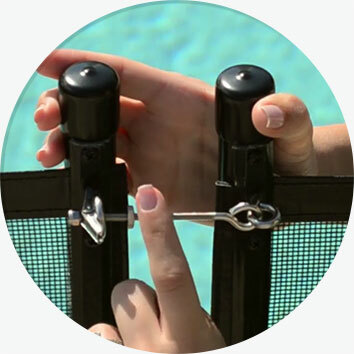 In just a few quick steps, you can unlatch, unlock, and roll up your pool fence. Just as easily, you can lock it back in place, keeping your fence safely in place. Our SureSafeTM Features make it all possible. Protect-A-Child’s Point-Lock Secure Latch is easy to open for adults, but prevents small fingers from unlocking it. To operate the pool fence latch, first reverse or loosen the jam nut far enough to allow the wing mechanism to fully compress. Next, squeeze the posts together with one hand. With the other hand, compress the wing mechanism so that it clears through the eye screw. Release the squeezed posts allowing the compressed wing to pass back through the eye screw. Our pool fence’s Lock-in-Deck option is the only post system available that twist locks your pool fence securely into your deck. To remove, first twist your posts a quarter turn to align with the sleeve groove. Once aligned, pull straight up and lift out the fence post. 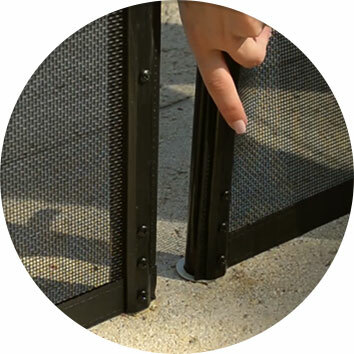 As you can see, this is a simple, yet secure option for your posts, and it eliminates one of the most vulnerable areas of a mesh fence. The Lock-in-Deck feature is only offered by Protect-A-Child. Lift each pool fence post out while rolling up the fence section. Once you come to the last post for that section (there are six posts in the longest section), lift out the rolled section. Each section is light, weighing approximately 15 lbs, so it is easy to handle. Repeat this for each section until the entire fence has been removed. 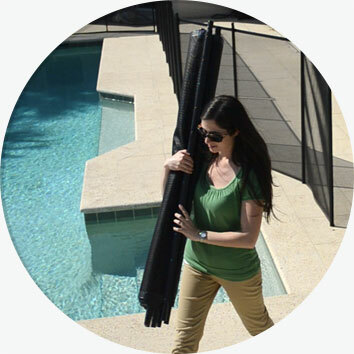 We recommend storing your rolled-up pool fence sections in the corner of the patio, a garage or shed—preferably out of the weather, in a dry location. You will be surprised by how little space is needed to store even 100 ft of Protect-A-Child fencing! 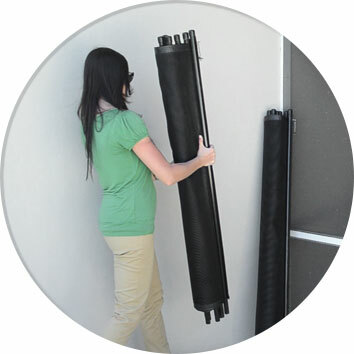 To remove all traces of your pool fence, we provide patio caps to cover the small post holes. 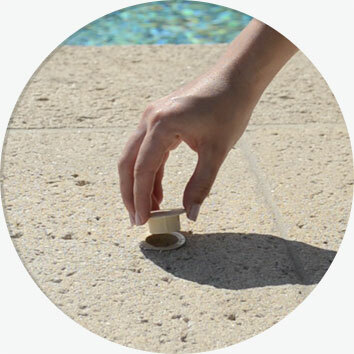 Our patio caps come in four stylish colors to match your patio surface, whether it is made with cool deck, travertine, or brick pavers. These caps fit flush and tight to prevent washing out during heavy rain or patio rinsing.